Cerion combines ERP systems with modern cloud platform user experience to digitally transform industrial processes and operating models. We help our clients create digital strategies and put them into practice. 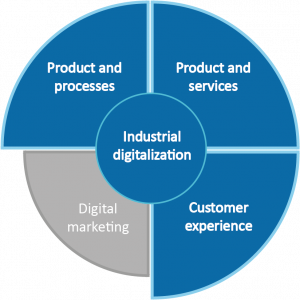 Digital transformation makes companies’ key processes and production chains more efficient. This helps business create new collaboration networks – the real benefit of going digital. One of Cerion’s solutions that support networking is building supplier portals that enable companies and their suppliers to work together in a fully digital procurement process with efficient records management. Smart solutions for machinery and devices are revolutionizing industry. The Internet of Things (IoT) is finally becoming a part of everyday industrial processes. New smart products and devices know their own history, can optimize their processes, and report to their owners. For example, Cerion has experience of gathering data streams from IoT devices in an Azure cloud, where machine learning processes the data for self-diagnostics. Digital transformation has a role to play in customer experience, too. Cerion creates customer portals to give companies’ customers digital access to services. Customers can log onto a cloud platform, for example, to view their own installations, operating status and other relevant information about products. Customer-oriented digital service solutions reduce processing times and improve communication. When industry goes digital, customers are the biggest winners. Digital marketing refers to a company’s online and social media presence. Ota yhteyttä, niin räätälöimme organisaatiosi tarpeiden mukaisen ratkaisun. © 2019. Developed by Sofokus Oy. Käytämme sivuillamme evästeitä, jatkamalla hyväksyt evästeiden käytön. Rekisteriseloste.